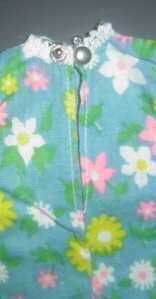 Many (cheap) doll clothes were produced in the 1960s and 1970s that had no label and are hence very difficult to identify. Plasty did never use labels for their fashion doll clothes, therefore one can only investigate in old Petra catalogs for identification help. It is sometimes really difficult to identify Petra clothes. I have bought lots from Germany from the 1960s-70s with hundreds of pieces, where i only could identify 10-20 percent of the clothes as Petra- or Barbie items. Among german and american lots from the 1960s/70s I often find dresses with "Hong Kong" labels. However, a big pile of out of such a vintage lot often stays unidentified. I highly recommend the websites of Linda from United Kingdom and the website of Martha from Denmark, where you can find almost all Petra catalogs (booklets) from 1965-1979 and many photos of Petra fashions. There is some confusion about the fashions of the early years though (I believe that Petra fashions started in 1965, not in 1964); see "catalogs". I am pretty sure that Plasty produced more clothes than were presented in their catalogs, because i own Petra clothes that are not shown in the catalogs (for example the so-called Goldpunkt outfits). Furthermore Plasty used different fabrics for the same outfits. All this together makes the identification of Plasty fashion doll cothes difficult sometimes. 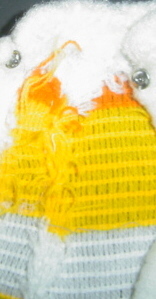 A word about the snaps: first picture (below) shows the thicker snaps, that are typical for some of the Plasty-produced "Boutique" outfits during the 1970s. The second picture shows standard snaps, that were used for the very most Plasty outfits. The third picture shows a slide-show with Plasty outfits from the 1960s and the fourth is a slide-show with outfits from the 1970s.